Hotel Palladium is one of the ornaments of Mykonos island as it follows the traditional architecture of Cyclades, with stones decorating big part of its exterior walls. 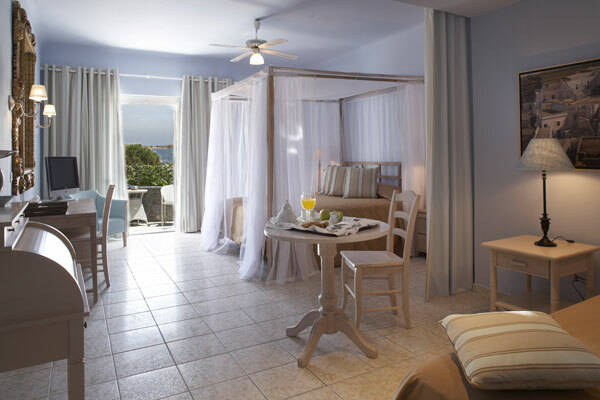 It is located in one of the best spots in Platis Gialos with spectacular view to the Aegean sea and the whole island. The experienced personnel and the fine services will make you have the time of your life. All rooms and suites are equipped with A/C, satellite TV, mini bar, direct dial telephone, safe, Internet access, sitting area, music, DVD, bath amenities and a balcony with fantastic pool or sea view. The outside area features the swimming pool with the sunbeds and a beautiful garden all around it, the kids pool, the restaurant for your everyday meals and sport activities for all guests. Our hotel is the best choice for your accommodation during your stay in the island, since it is very close to the most famous beaches, such as Psarou and Platis Gialos beach. There is a bus station just 20 m from the hotel, while the port and the airport are a few kilometers from here. Είστε ιδιοκτήτης ή διευθυντής στο PALLADIUM BOUTIQUE HOTEL; Εγγραφείτε τώρα για δωρεάν εργαλεία, που μπορείτε να χρησιμοποιήσετε για να βελτιώσετε την καταχώρησή σας και να συνδέσετε την ιστοσελίδα σας και το σύστημα κρατήσεών σας.